July | 2012 | How Lucky Can Anybody Be? So, it was my birthday on the 15th. Let’s all observe a moment of silence for the aging process…now, back to chocolate! 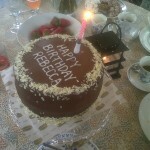 I ordered a cake to share with my family and friends from Rubens. It was the definitive chocolate cake. Other cakes aspire to achieve this level of chocolaty goodness. Please see the amazing picture and how nicely decorated it was! Check this space next month for another instalment of “A Year of Chocolate Continues”. This month was also eventful, as I won a prize for my niece Olivia from The Hungry Oven cooking school, courtesy of Hummingbird604.com. Olivia will join a cooking class for a week and will receive an apron, a backpack, a cookbook, and copies of the recipes they use. Again, check this space next month to hear about her experience learning to cook. I started cooking at age nine, so Olivia will have a head start, as she’s just six and a half!